People who fill out a Spherion Staffing and Recruiting application are looking to join a company that works with companies and job seekers to match them together and create a working partnership that will hopefully continue for long periods of time. Links to apply for jobs at Spherion Staffing and Recruiting are at the bottom of the page. In 1946, City Car Unloaders was based in Chicago, Illinois and worked to find places for manual laborers to work. The company did well and changed their name, going as Personnel Pool of America and was acquired by H&R Block in 1978. In 1991, H&R Block bought Interim Systems of America and combined it with Personnel Pool, changing the name to Interim Services Inc. In 1994, H&R Block spun off Interim Services, who bought up other companies. With the arrival of a new century, the company name changed again to Spherion. Randstad Holdings acquired the parent company of Spherion Staffing and Recruiting in 2011. Although they are a staffing agency, Spherion Staffing and Recruiting only deals with specific industries, usually administrative, industrial, customer service, non-clinical healthcare, and various professional specialties. Even through Spherion Staffing and Recruiting has these specifics, they’ll work with anybody to find a job. If you choose to go for Spherion Staffing and Recruiting jobs at the corporate level, you’ll find yourself working for the SFN Group. Within that company, you could be working with any of their brand names that cover a wide range of service and products, usually in the staffing industry. Locally, people with Spherion Staffing and Recruiting careers find themselves working in franchises scattered around the country. Within those locations, there will be thousands of clients for employees to match together for temporary or permanent positions with other companies. How old do you have to be to work at Spherion Staffing and Recruiting? Age requirements vary by position. As you look at Spherion Staffing and Recruiting jobs online, read all the position needs carefully, as some positions may require various degrees, certifications, or experiences before you may be hired. Because all Spherion Staffing and Recruiting locations are franchises, hours will vary from location to location. Generally, they will run on usual business hours, opening anywhere between eight and nine am and closing at any time between five and six pm. Branch Manager – You’ll work closely with the franchisee to make sure that everything is working smoothly in your location. When issues arise, you are the first line of defense in order to try and make everything right. Compensation is around $35,000 a year. Client Service Supervisor – When clients come, looking for people to fill their empty positions, they’ll work closely with you. Also, if issues arise, they’ll work with you to find a solution to their issues. Compensation is around $25,000 a year. Senior Recruiter – Generally, after working as a regular recruiter, you’ll have built up a stable set of clients and people to fill those positions. As such, you’ll have a broad spectrum of specializations that you can find match people up in. Compensation is around $70,000 a year. Recruiter – You will work to have a broad specialization and create a solid client list of people who need jobs and companies that have openings. As needed, you’ll match job seekers with positions, making sure that they’ll be able to work well together before you fill the position. Compensation is around $40,000 a year. Why do you want to work for Spherion Staffing and Recruiting? This is an extremely common interview question, so you should be prepared for it. Talk about what drew you to the company, whether it was the culture or benefits and why it’s your first choice in places to work. What experience do you have? If you have any relevant experience, talk about it. If you don’t, talk about what you can offer the company and bring to the position. Use plenty of examples to back up and support any claims that you may make. Where do you see yourself in the next few years? Your interviewer wants to know if you see yourself with the company. Talk about how you’re willing to take on extra challenges and responsibilities in order to move up in the company, being realistic in your career expectations. Because Spherion Staffing and Recruiting relies heavily on customers for their business, you may be asked this question in the form of a hypothetical situation: How would take care of an upset customer? Walk your interviewer through the steps that you would take in order to turn the customer’s experience around, making sure to be practical and realistic. Many positions will have you working to match people with positions and companies, so you may be asked: How would you make the best pairings with your clients? Explain to your interviewer what traits you would look for in your customers to match them and why you think certain pairings work well. How to apply for Spherion Staffing and Recruiting online: If you’re looking to fill out a Spherion Staffing and Recruiting application at the local level online, you’ll need to go to the specific location’s website and search for the position that you want. Once you’ve found it, follow the instructions. 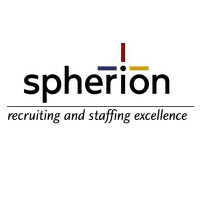 A printable application for Spherion Staffing and Recruiting may be available at select locations. Before attending your interview, do research on Spherion Staffing and Recruiting and the industry in order to come up with a list of questions that you can ask. For an entry level position, this may seem excessive, but it will put you head of the other candidates as it shows that you think ahead and are prepared. Your interview will probably take place in a semi-formal setting, so you should dress in business casual. If you’ve applied for a managerial position, a suit would be appropriate. Have a positive and friendly demeanor when you attend your interview as it will give a good impression. Show gratitude at the opportunity to interview with Spherion Staffing and Recruiting. After your interview, inquire about the best way to check on your hiring status. Very few candidates will learn if they got the job during the interview as the Spherion Staffing and Recruiting will want to screen all applicants before making a final decision. Charter Communications: Visit the job application for Charter Communications to apply today. Halliburton Construction: Use the Halliburton Construction job application to apply here. Coca Cola: Visit the job application for Coca Cola to apply today. Adecco Staffing: Visit the job application for Adecco Staffing to apply today. Dole: Use the Dole job application to apply here.